When one searches Beer Advocate for the world's best Belgian Quadruple, the top beer listed is from Belgium. In fact, the top four beers are from Belgium. When one searches for the best English Porter, the top beer listed is from England; and when one searches the best American IPA, top best beer listed is from the USA. But when one searches for the best German Pilsener, the best offering listed is not from Germany (it is from the USA). A German beer is listed second. But it's even worse on the other top beer review site, RateBeer. On RateBeer (which has a predominantly European focus), the top twelve German Pilseners listed aren't from Germany. The United States, Denmark, Holland, Italy, and even New Zealand have beers that are listed first, with the Pyraser Hopfenplücker Pils taking 13th. Granted, Pilseners aren't the only beers that have suffered this fate: there are other styles that were invented in different cultures that have since been taken over by foreigners (English Oatmeal Stouts and Finnish Sah'Tea immediately come to mind). But generally speaking, the beer that is a nation's definitive style remains best done in the land of it's birth. One possibility is simply that there aren't enough Germans using Beer Advocate or RateBeer. Rating beer is obviously high subjective, and perhaps there are some amazing beers out there that the frequent users of these major websites just haven't tried. But that said, it is a fact that the German palate has changed; the younger generation has less interest in beer and more interest in Gatorade or sparkling water. As a result, many German macrobreweries have been brewing fruity juice-like beers with very little alcohol (for example Radler – which mixes Pilsener with Lemonade – or Beck's Lime). And when the average German does drink a beer, they tend towards a very light flavored beer quite reminiscent of American Budweiser. This shift in drinking pattern has had a major effect on the industry. As of January 2011, German brewing had dropped to less than 100 million hecoliters. (To put that in perspective, that's less than half of what the US produces.) While Germany used to have the most breweries of any country in the world, they now have 25% fewer breweries than the US. Berlin, which at one point in the 19th century boasted 700 breweries, now sports fewer than a dozen. Consequently, many of Germany's top brewers are leaving for other more beer-friendly lands. This isn't to say, of course, that there is no good beer in Germany. Far from it; I still cannot find a better Hefeweizen, for example, anywhere else in the world. But the Pilsener, in many ways the native drink of Germany, has really suffered and fallen to the wayside. This summer, I will be spending about two months in Germany. Amongst many other (more productive) goals, I am on a mission to try finding the best Pilsener in Germany. While the US may have stollen this style, I cannot help but believe that there are little breweries dotting the German landscape that still brew a mean Pils. Maybe they aren't on these Beer Advocate and RateBeer lists because they're so small no one outside of the country really knows about them. Whatever the case, I'm going to try to track them down. Of course, I'm biased. I'm American, and I enjoy a couple of really great American/German Pilseners. Perhaps my favorite? Victory's Prima Pils: bright, clean, clear, refreshing, with a bit of grapefruit, it's the hoppiest Pils I've had. A close second (though entirely different) would be Sam Adams' Noble Pils. Very floral with flavors of lavender, lilac, and faint flavors of hibiscus and slight cloves. Not at all bitter, it instead leaves a lingering sweetness on the tongue. But though they are incredible beers, both Victory's and Sam's Pils offerings really stray from the flavor profile of an authentic Pils; I'm simply not going to find a beer like either of those anywhere in Germany. 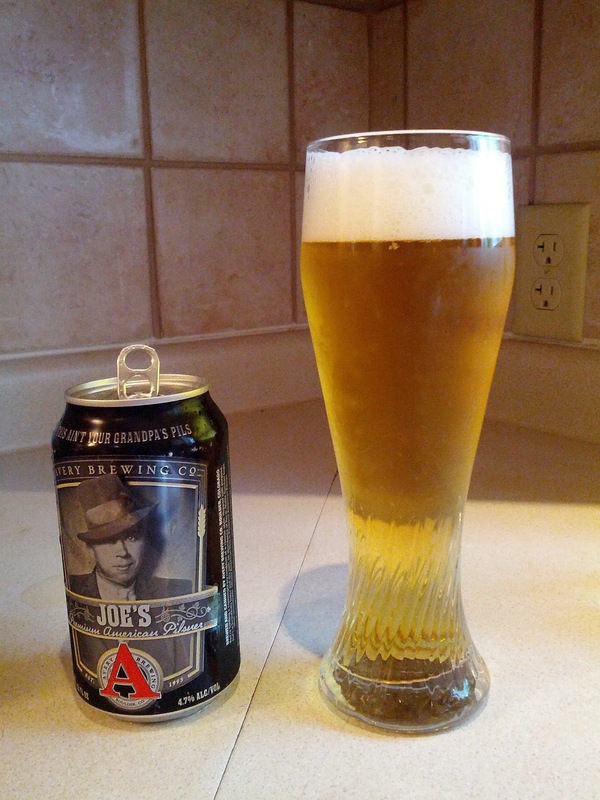 So to kick off my German Pilsener Quest, I cracked open Joe's from Avery in Colorado. This is a lovely beer with a nose like spring rain, full of citrus, a slight hop bite, and with an excellent dry, caramel malt finish. There's nothing unusual about the beer; it's just really good.